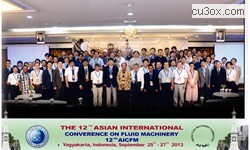 Asian Fluid Machinery Committee (AFMC) has been established during 9th Asian International Conference on Fluid Machinery (AICFM) held in Jeju, Korea, in Oct. 2007 in order to take charge of the AICFM by selecting a conference venue and constituting an organizing committee, and also to take charge of various activities and events for advancement of both industry and academia of fluid machinery related fields inside Asia. Now, the AFMC consists of 24 members from 9 Asian countries, i.e., China, India, Indonesia, Japan, Korea, Malaysia, Singapore, Taiwan, and Thailand.The AFMC is open to all Asian countries, and thus any new member countries are welcome. Prof. Shin-Hyoung Kang was the first chairman and Prof. Tsujimoto Yoshinobu was the second chairman of the AFMC. I appreciate their great contributions to the AFMC. The AICFM has developed from the fourth conference (1993) as an International Conference though the start was held in two countries of Japan and China. The fifth to twelfth were held in Seoul (1997), Johor Bharu (200), Fukuoka (2003), Yichang (2005), Jeju (2007), Kuala Lumpur (2009), Chennai (2011), and Yogyakarta (2013). Scope of AICFM includes all engineering aspects of fluid machinery and systems including design, manufacturing, operation, and new applications. Most of the technical areas covered by AICFM are industry oriented fields, and thus we expect rapid circulation of the information through this conference. I’m glad to open the official website of AFMC. I wish this website will become a portal to disseminate information about the activities of AFMC and AICFM. Hopefully this website will also serve as a platform to exchange ideas and technologies about fluid machinery, especially in the effort to foster strong relationship among fluid machinery experts in Asia.